After the delightful surprise of a sunny first day on the Camino del Norte, we woke on Day 2 to the sound of rain. This wasn’t much of a surprise; the Norte is notoriously wet – the price they pay for all of the dense green colors and coastal views. So after a hearty breakfast (shared again with French middle schoolers) We packed the electronics (including the camera) in the depths of our trash-bag-lined backpacks, stretched rain covers over the whole thing, geared ourselves up, and set out down the last 3 kilometers of the mountain, slipping on the mud and dodging very committed mountain bikers. I had only fleeting glances of San Sebastian (called Donostia in the Basque language Euskera) as we blew—almost literally—through the famous city. The wind pushed the rain in almost horizontal sheets across the slippery promenade and mostly empty beaches, and we barely paused to watch the handful of intrepid surfers and mostly older bathers taking their morning swim, no matter what. Someday, this will be a lovely place to come back and linger for a few days, but this was not the day. We climbed out of the city and back into the hills, and then, from San Sebastian to Orio, we were on our own. The rain kept falling, and there were no towns, no bars for coffee (or bathrooms), not even a picnic shelter to cover us for a few minutes of rest. Camino Norte tip: if you’re debating your footwear, go for the waterproof option. For most of the day, there were no other people in sight. Eric walked ahead of me, stopping to let me catch up every half hour or so, and I didn’t see other pilgrims until the very end. Without a camera or conversation to distract me, I let my mind rest and just walked. We followed rural roads through dense woods and rolling fields, the ocean often in sight to our right. The views, even in the rain, were stunning. Red cows and white sheep dotted the fields on the edges of bluffs, and I was jealous of their views, even on a day like this. Even on Day 2, though, when my feet are fresh and my attitude is good, 18 kilometers (11 miles) of walking without a single break is tough. As we started the long, steep descent toward Orio on what was quaintly called “an original Basque road” (which I translated as “uneven, rough, ankle-threatening, knee-destroying cobblestones that have settled over the years at odd angles, and become slippery and muddy in constant rain and are trying to kill you”), I was ready to be done. And just a few minutes later, I was. The albergue in San Martín had been recommended by several people as one of their favorites on the Camino, and even in the rain and mud, I could see the appeal. The sleeping area itself was nothing special, with 20 beds tucked in what I assume was originally a cow barn on the windowless ground floor of an old Basque-style house. Because of the rain outside, we had to string our wet clothes from the lines hanging between beds, adding to the cramped feeling. But the three women who ran the place were warm and funny, and prone to hugs, and the outside lawn sloped down to a separate kitchen/social area with a lovely view over the river and to the green, green hills beyond. On a sunny day, this would indeed be paradise. On a rainy day, though, the yard was out of the question, and so 20 damp people spent a rather close afternoon trying to stay warm and out of each other’s way as we waited for dinner. One of the reasons I’d decided to stop at Albergue San Martín was because they offer a communal dinner every night. This had been normal for us in France on the Via Podiensis (see Eating Our Way Across France), and I loved the sense of community that came with a shared meal. This is where stories come out and true bonds are formed. 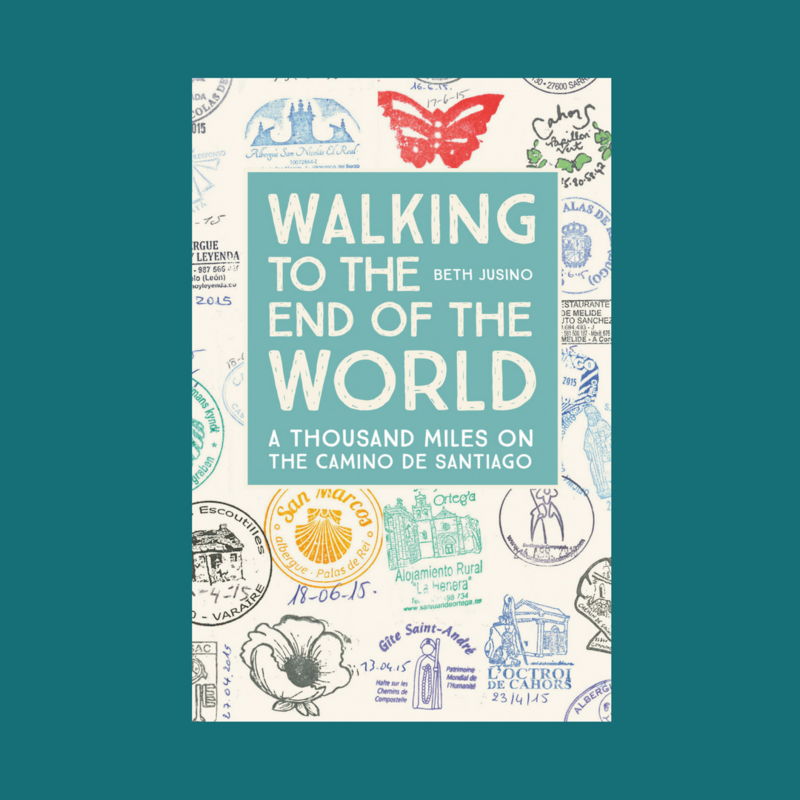 The Camino, always, is about the people just as much as the long walks and great views. And so in San Martín at promptly seven o’clock, twenty people gathered around a long table in the chilly kitchen building, filling it with our own warmth. 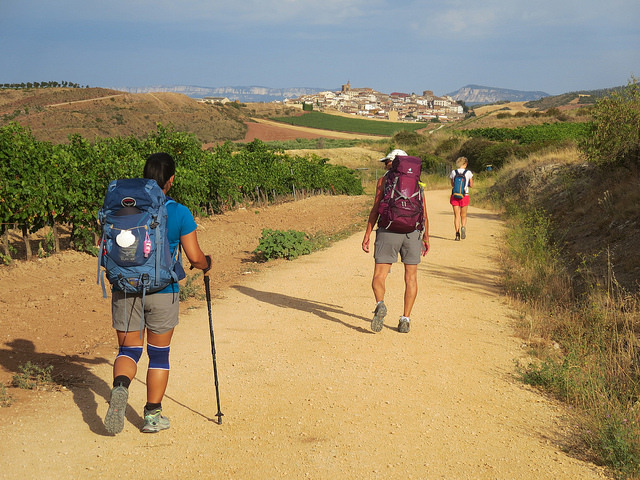 And here, without me consciously knowing it, my Camino family started to form. The cheerful man who spoke French and Spanish fluently, smiling all the time even as he shivered in shorts while his hiking pants dried. The two older German women who told me about growing up in East Germany, learning Russian instead of English and then watching everything change when the Iron Curtain fell. One of them had four Compostelas already, and was back for a fifth. Two younger (well, my age) German women who giggled and stayed mostly to themselves. A very young Korean exchange student who spoke no Spanish at all, and was very confused why the hospitalera kept calling her guapa. An older Australian who smoked cheroots in the rain and poured the wine liberally for us all. It would take a few more days before I learned (or at least remembered) all of their names, but it’s because of them that I crawled into my bunk bed smiling, remembering why the discomforts are worth it. And when we woke the next morning, there was a rainbow promising a new, hopefully drier, day. *No, dogs aren’t really allowed in albergues along the Camino, for obvious reasons (everyone sleeping in dorms, allergies, etc.). But some of the private albergues, like San Martin, were willing to let Kiwi sleep just outside, under sheltered porches and among the shoes and backpacks. Of all your posts so far, this is my favorite one. It evoked for me, in a very real way, the sense of struggle against the elements. And the fact that it wasn’t scaling Mt. Everest or canoeing across the Pacific or some other kind of extreme endeavor…made it all the more relate-able…this is a trip many of us will take.